USA – When describing his lighting design for the second leg of superstar Romeo Santos’ Golden Tour, Bruce Rodgers of Tribe, Inc. says: “It’s all about scale and simplicity.” The 'scale' part is readily apparent to anyone who catches a show on the 18-city tour that began in September. Dominating the area over centre stage is a colossal overhead truss structure that resembles a UFO about to land. 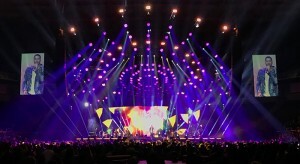 Intense brightness radiates from the hovering form, courtesy of 117 Chauvet Professional Maverick MK3 Wash fixtures, which were supplied by 4Wall Entertainment Lighting. The 'simplicity' Rodgers refers to may not be as instantly obvious, but once the initial awe inspired by this circular overhead panorama passes, it too becomes easy to appreciate. For all its size and power, there is no waste in Rodger’s Golden Tour lighting design. No distractions. No dead-end flourishes. Just a beautifully balanced blend of circles and sticks, working in harmony with a slightly convex video wall. Rodgers, who achieved international acclaim as a production designer on Super Bowl halftime shows and on tours for stars like Madonna, uses the fixtures and video wall in his rig to create a holistic scenic image that engages the audience while supporting Santos’ performance. There were a number of reasons why the Maverick MK3 Wash fixtures were selected for the gigantic overhead structure, according to Rodgers. 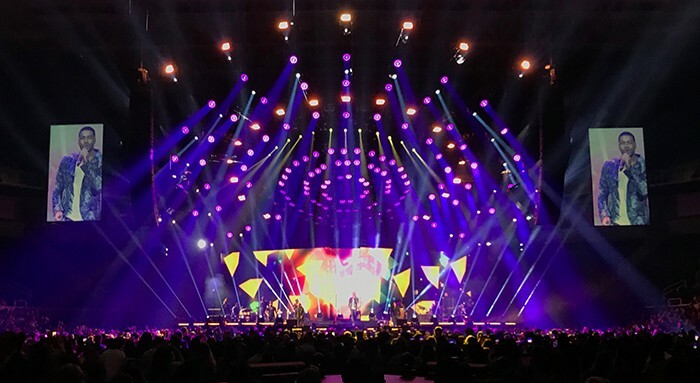 In addition to their relatively compact size, which is making tear down and setup easier on the tour, the RGBW movers are providing rich, realistic colours to reflect the changing moods of the show. The Maverick units are also used to create a wide variety of looks, thanks to their built-in colour gobos, wide zoom range and pixel mapping capabilities. With a variety of looks emanating from the sunburst circle over the stage, the distinction between lighting and scenic seems to have disappeared. 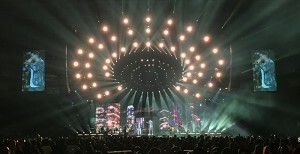 As Rodgers describes it: “Lighting flows naturally” from the stage design. This creates a massive visual that is at once simple, elegant and endlessly engaging.